A few months ago, my best friend told me to about a new online music service called Spotify. Now I know it’s not the vogue thing to do anymore, but I still like to pay for music from time to time. Sure, don’t get me wrong, I have stolen music in the past but if I really like something I always make a purchase, especially if it’s a new/up-and-coming band. I’ve been intrigued and tempted by online music services in the past, but thus far I haven’t been super-impressed with any of them. Last year I joined EMusic, a service that works a bit like an old school CD/record club fused with iTunes. You picked a membership level and depending on how much you wanted to spend, you got so many downloads a month. You could always download more if you wanted to, so there wasn’t a limit on how much you could get. I initially liked the service because unlike iTunes, you got to actually own the music you were buying–the MP3’s were free of annoying copyright stuff (you could easily transfer the files to another computer or MP3-device, you could burn the tracks as much as you liked, etc.) . The drawback to EMusic was two-fold: firstly, if you didn’t use all your allotted credits by the end of the month you lost them, they didn’t “roll over” which they should have, after all I DID pay for them. 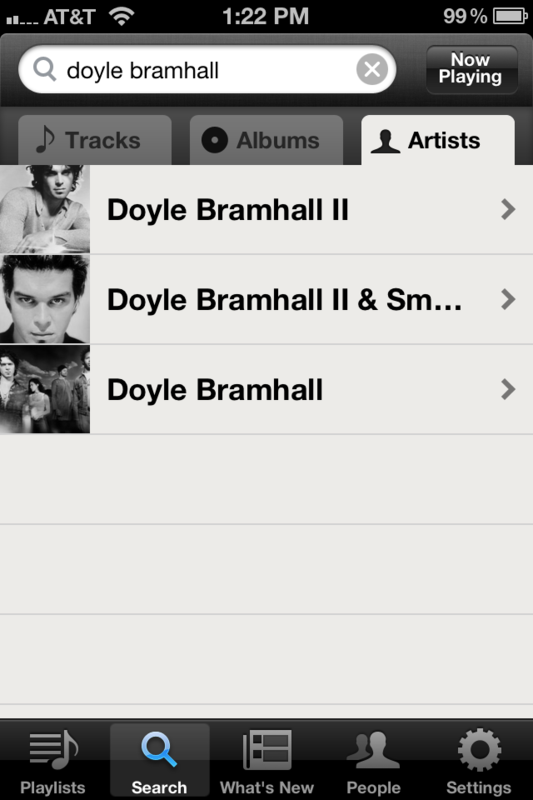 Secondly, while EMusic did have a very nice selection of music, it didn’t have everything a boy like me could want. But what really made me pull my money out of the service was when the entire system was overhauled and they switched from credits to actual money (which was nice, as the credits were a bit esoteric) and made everything more costly. What was once $0.50 cheaper than iTunes was about the same cost. My computer’s hard drive was also taxed–downloading music requires a BIG hard drive, especially when every month you’re forced (whether you want to or not) to download 20 songs. This is what Spotify looks like. This is what bliss looks like. Last FM, Pandora, and many similar services appeal to a lot of people, but I don’t like to just sit and listen to random playlists–I like to hear entire albums sometimes. Spotify allows you to do both. The service has an interface that’s very similar to iTunes, with it you can search for artists and listen to whole, entire albums: bliss. In addition, you can create playlists or listen to an artists “radio” station that gives you a randomized experience similar to what Pandora would give you–you get the artist you choose, plus other artists that are similar. 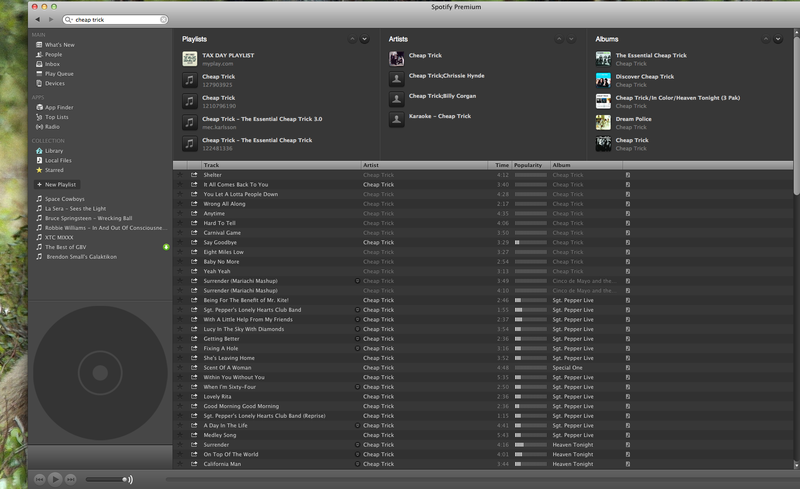 The Spotify experience on a computer is pretty good, the interface is intuitive and clean. If you already have music on your computer, Spotify brings that music into your experience as well, thus replacing iTunes as your music player (should you choose). It’s important to note this, because I have a LOT of music already on my computer, having Spotify use what’s already on my computer is helpful, though not as necessary as you might think since Spotify has a staggering catalogue of music. Spotify does not have everything, but they get damn close. Basically, the rule of thumb is: if you can’t get it on iTunes you aren’t going to get it on Spotify. That said, there are some pretty big bands that iTunes has that Spotify does not, like The Beatles and Metallica. Those bands have historically had a poor relationship with selling their music online, so their absence isn’t too terribly shocking. Same goes for AC/DC, Led Zeppelin, and Def Leppard. These huge bands are missing, but pretty much everything else is on Spotify. Do you like obscure music? I do. And Spotify has a fantastic collection of really hard to find music. More often than not I’m shocked at what I can get on Spotify rather than what I can’t get, which has not been the case with most online music offerings. Spotify basically tricks people into thinking they’re going to get all this glorious music for the cost of a very short ad every three or four songs, but in fact, when you sign-up (for free) you are actually entering a 90-day trial where you get unlimited music with ads. Once this honeymoon period is over, you are then limited not only by ads but you get so many hours you can listen daily. This is a bit nebulous and I suspect that as the service grows in popularity, the length of the unlimited trial will shrink as will the number of hours you’ll be able to listen once said trial is over. It’s actually really hard to find information on this at all on the Spotify website, so I don’t know what the hourly allowance once the trial ends. I fell in love with Spotify and signed up for Spotify Premium before my 90 days were up so I didn’t get to discover this on my own. And it’s here, with a actual paid accounts, that Spotify stumbles a bit. 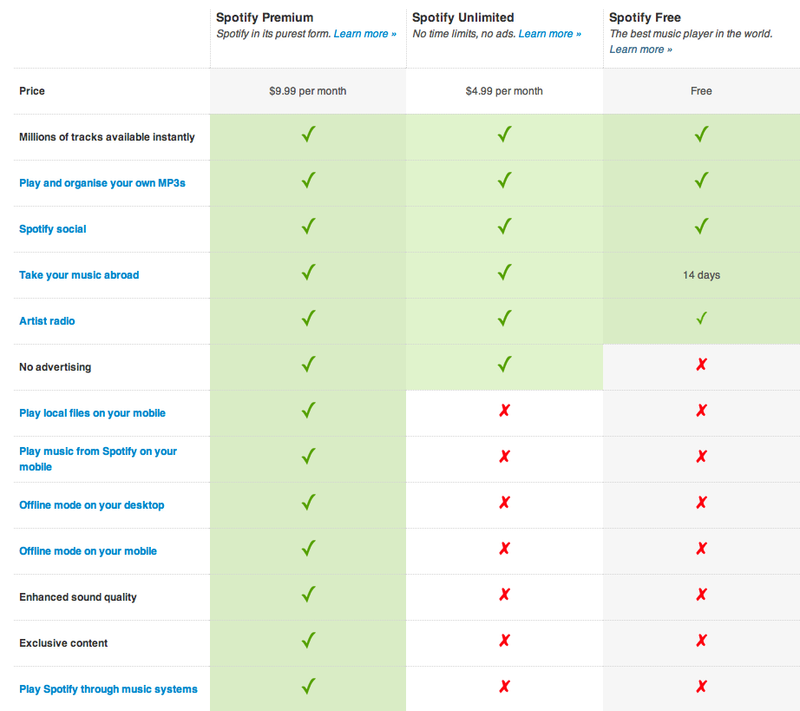 First, there are two tiers one that gives you unlimited music on your computer, with no commercials for $4.99 a month. That’s a really good deal considering all that you are getting (millions of songs with new stuff being added daily). The Premium service is $9.99 a month and gives you all that plus you can have Spotify on your phone. Having Spotify on the-go in theory is really cool. But the app for the iPhone is clunky and cumbersome. It’s not as easy to navigate as the computer-based version of Spotify. In addition, it’s greatly stripped down: there is no “artist radio stations” on the current phone app, there is also no way to check out similar artists–a feature I love on the computer version of Spotify. If, like me, you enjoy hoping from artist to artist exploring new music the phone app will leave you cold. In addition, the app is designed around the idea that you’re going to use the playlist feature. Like I stated earlier, I like listening to ALBUMS not PLAYLISTS. I’m old school, and if you’re old school too you’re going to have to make playlists of albums. The app also is a data-plan and battery killer. My iPhone almost never goes dead but with a 45 minute trip to the gym (where I rock out) my iPhone loses 30-45% of it’s battery life. That’s a pretty noticeable drain. The data plan also hit because Spotify is a streaming service, which means if you’re not tethered to a Wi-Fi network you are using precious data. Now what’s awesome about Spotify’s app is that they realize that this might be a problem and they let you synch your playlists (ugh, again with the playlists) to your device so you can listen offline. They’ll let you “download”/synch up to 3,000 tracks to your device, which I daresay is more than anyone really needs on the go. You can synch when you’re using your data plan but this, I discovered on a long train ride, will devour your data plan (you can switch off this capability, and I recommend you do it). Why would you synch when you don’t have Wi-Fi? Well if you’re traveling through an area with poor coverage (like I was) you might find yourself wanting to synch a few extra songs to sustain you. It’s nice that they allow you to listen to their music offline (you can do this on the computer version, too if you have the Premium version). Hope you can spell, the search feature on the iPhone app version is not forgiving. Lastly, Spotify is also a social network in that you can share your playlists and what you’re listening to with other people. I don’t like how the service REQUIRES you have a Facebook account, and it must be in good standing, you can’t sign up and then deactivate your Facebook account, if you do it shuts down your Spotify account. As someone who has a love/hate relationship with Facebook this is almost a deal breaker for me. If the service didn’t have so much music I’d probably back out of it. It’s also a bit creepy that everyone can see what you’re listening to on Facebook. Now you CAN enter a private session, where people can’t see that you’re listening to Brittany Spears…but it will eventually turn itself back on after a set amount of time. In my opinion, the feature should remain off until the user switches it back on.That said, it’s really cool to see what my Spotify-using friends are listening to. It’s awesome to send someone a track, artist, playlist, or album to listen to. Overall, I love Spotify. I worry that since there was no contract I had to sign for my Premium membership that the rates will jump up with no warning. If the price stays the same and they don’t strip/limit the current features, then I’d heartily recommend it to anyone who loves music and wants to legally listen to music online. It’s strange to not own my music, but quite frankly my hundreds of CDs take up too much space. Now if I want to hear a song or album I don’t have on my computer, I can instantly hear it, without first hunting the CD down (again I have 500 or so CDs, so this is a real problem for me). I think most people should stick with the middle tier, $4.99 service because the app isn’t as good as it should be (for now at least, I keep praying for an update). That said, if you’re a music junkie like me, the Premium app is a good value ($120 a year for unlimited music? Hell yes!). PROS: Massive selection of music, high-quality sound, affordable multi-tier membership plans, no more looking through your CDs, no contract to sign up, stream music anywhere even through a home sound system. CONS: App could be better, App could kill your data plan if you let it, company is not upfront about the limitations of the free membership, no contract to sign up means prices could change anytime, no more looking through your CDs, you don’t own your music, you MUST have a Facebook account. Thanks for the comment! I’m in love with the Spotify app I hadn’t heard about that contest, but I want to enter it now.